In yesterday’s photograph you saw prairie flameleaf sumac, Rhus lanceolata, at its colorful peak but out of focus behind a greenbrier vine that had lasssoed a goldeneye flower stalk. Now here’s a look at some vibrant flameleaf sumac leaves in the foreground, where you can get a better look at them. This time what’s out of focus in the background is a paloverde tree, whose branches and leaves in their young light-greenness contrast with the red of the sumac. The date was November 20, and the location an undeveloped property behind Seton Northwest Hospital in my section of Austin. 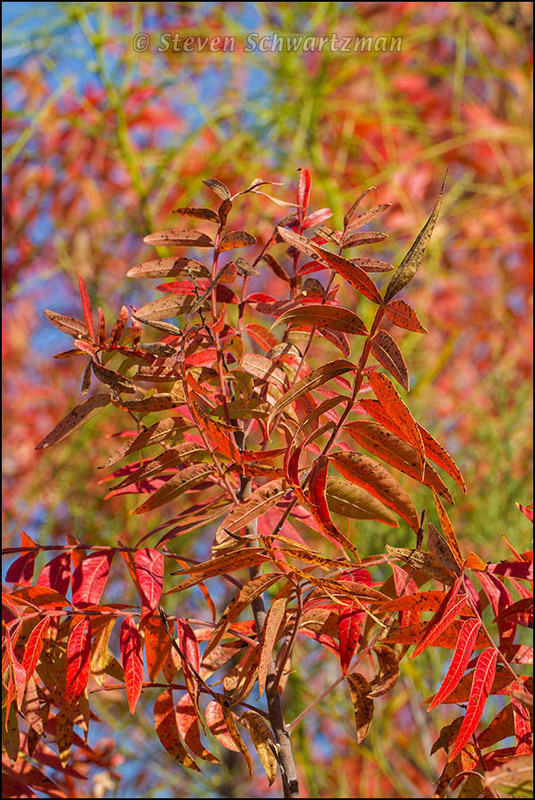 Happy beginning of December and happy fall color, which I’m still finding in our flameleaf sumacs. The twisty flames really come out in this one. Thanks for your “inflammatory” comment. Your eyes are faithful witnesses: each compound leaf’s central stem is indeed winged, and those wings also turn red. I’ve seen cases where all the leaflets have fallen off and all that remains is a chain of red wings. Let’s hope you find some like that. They can look quite nice against a bright blue sky. I love the show of color that sumac puts on every fall! Me too. I even vaguely remember it from my childhood on Long Island, but of course up there so many trees turn colorful in the fall that the diminutive sumac hardly stands out unless you see one in isolation. Here in central Texas we’re a far cry from the fabulous fall colors of the deciduous forest of the Northeast, so local trees that turn take on a special significance. Flameleaf sumacs are our most reliable and widespread source of fall color, and that’s one reason I’ve featured them four posts in a row, at the risk of trying the patience of some of you up north for whom fall color is not as rare as it is down here.